Pickle stand : stainless steel for pickle with Steel lid. Look is unique and attractive. 3 Transparent pickle pot with Steel lid. Our company is able to to manufacturing and supplying Stainless Steel Pickle Jars. We are one of the best manufacturer of Stainless Steel Pickle Jars. 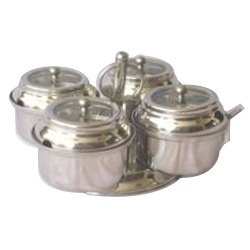 We are manufacturers of Stainless Steel Pickle Set. These are designed and developed using top quality raw materials and using best available techniques. Our products are admired for their designer appearance, fine finish and durability. In order to keep pace with never ending demands of the customers, our company is instrumental in providing SS Pickel Pot. 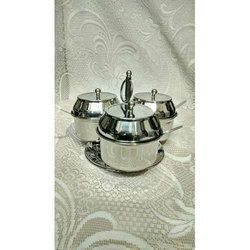 We are one of the most well-distinguished companies in the market that are into offering Stainless Steel Pickle Set. It's important to use the right jars for home canning so we provide a large range of Stainless Steel Pickle Jars. We are a emerging Supplier of Stainless Steel Pickle Jars. Using fine quality raw material and up to date techniques in our state-of -the art manufacturing facility, we offer Stainless Steel Pickle Jars. Katori - Copper Steel size 3"
We have been able to offer our clients a qualitative range of Stainless Steel Pickle Jars. We have founded ourselves as a recognized manufacturer of Stainless Steel Pickle Jars. This Pickle Pot has 3 Holders.Each holderhas a lid with A plastic cap which ensures that it can be handled with bare hands. In order to suit the various requirements of our clients, our enterprise is dedicatedly engaged in providing 3 SS Pickle Pot in the market.